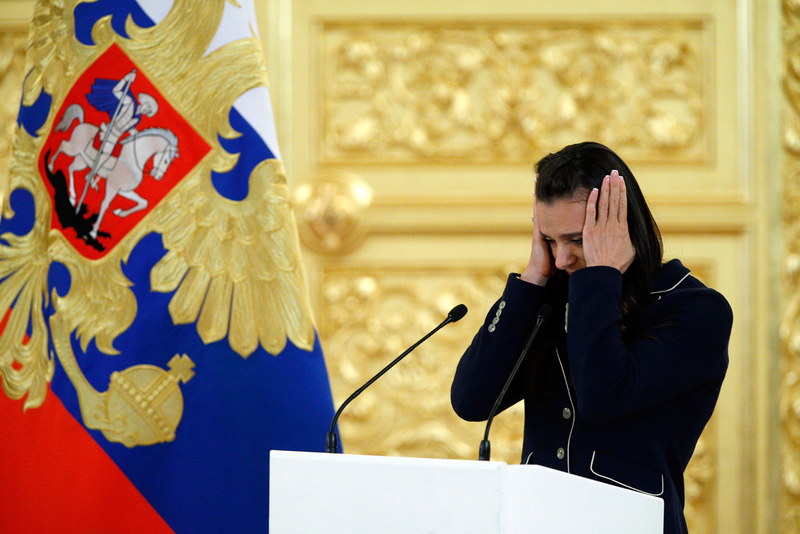 Russia's pole vaulter and Olympic champion Yelena Isinbayeva gestures as she speaks at the Kremlin, in Moscow. The International Olympic Committee’s muddled logic in what appears to be a decision lacking in conviction on Russia’s participation in the Rio Olympics has left many observers baffled. Why have the authorities rewritten the rules of the game and of the Games? While the legitimacy of the International Olympic Committee (IOC) decision to deal with a clear yet intricate doping scandal involving numerous Russian athletes cannot be questioned, the particulars of the ruling raises not only eyebrows but anxiety over the future of the Olympic games and the Olympic movement as a whole. There is a strong impression when reading the decision taken in Lausanne on July 24 that the members of the IOC Executive Board were uneasy with their own decision, and even hesitant. Athletes, doctors or officials: who pushed ‘meldonium’ use? The IOC, according to the charter, remains the ultimate authority in dealing with all matters, large or small, related to the Olympic Games. Yet the IOC has effectively passed the right of the final verdict on “clearance” for Russian athletes to go to Rio to the international federations. Why? Does this not amount to delegating or waiving of authority? It might appear to be a reasonable solution, provided the federations have more experience, expertise and instruments to analyze anti-doping test data; and to do so under the “pressing circumstances” and at short notice. If doing justice is the supreme motivation of the federations, and there are no grounds so far to doubt this, then their governing bodies will find ways to treat the challenge of the selection process case by case. In seeking justice, the Russian federation is entitled to the right to be heard and to appeal. Let’s not be under any illusions: rank-and file athletes can hardly present their defence correctly and convincingly. But here’s the rub: representation of Russian sports at the international level has been shrinking over the last few years. Making the voice of the accused athletes heard is almost mission impossible. With the opening ceremony of the Olympics in Rio due on August 5, the federations have enough time to sort out the matter, separate the wheat from the chaff and distinguish the sheep from the wolves. But again, it is a race against time, and many have already lost it. In a rather controversial move, the IOC has stated that Russian athletes “have to assume the consequences of what amounts to a collective responsibility,” making no distinction between athletes of integrity and commitment to fair play and those who abuse the system by taking illicit drugs to enhance their performance. Why? The latter deserve nothing but to be evicted from current sporting contests and ostracized in accordance with the gravity of their crimes. The former are decent people and must be treated as such and given their chance to prove their merit in international competition. The Stanford Encyclopedia of Philosophy details the argument of the supporters of collective responsibility who claim it “can be ascribed to agents fairly in at least some, if not all, cases.” Their opponents assert that collective responsibility violates the principles of both individual responsibility and fairness. No less worrisome is the IOC’s decision that the “presumption of innocence” cannot be applied to Russian athletes. This principle of common law proclaims that anybody charged with any wrongdoing or crime has the right to be presumed innocent until proven otherwise. This is part and parcel of human rights. It is practiced in most nations of the former British Commonwealth, and is enshrined in the U.S. Constitution by the Fifth and 14th Amendments. In these countries the system of justice abides by the rule that the defendant has no obligation to prove his innocence unless in retaliation to evidence presented in court. Actually, the roots of this legal principle go deeper; they are found in the Roman law: Ei incumbit probatio qui dicit, non qui negat. Literally it means “the burden of the proof lies upon him who affirms, not him who denies”; in other words, the proof of guilt has to be presented by the prosecution, not the defendant. The blame game to be continued? The comprehensive reform of the anti-doping system announced in Russia might eventually satisfy WADA and other critics, but this is not a given. There are too many uncomfortable parallels, no matter whether well founded or illusionary, with the “Cold War” fought on the Olympic turf back in the 1980s. Many Russians, judging by the never-ending discussion on Russian internet forums, social networks and radio programs, would like to have an answer: Has the IOC involuntarily embraced selective justice? If so, this would be deplorable. If this notion becomes dominant, the long-term repercussions for the Olympic movement would most certainly amount to suspicions, divisions and, their natural end product, animosity. It is hardly compatible with the moral principles that inspired Pierre de Coubertin when he restored the glorious endeavour of the ancient Greeks in 1896 by organizing the first modern incarnation of the ancient Olympics.